Wholesale Trader of a wide range of products which include tile sheet roll forming machine, roll forming machine, floor deck roll forming machine, hydraulic decoiler, double layer roll forming machine and plc unit hydraulic system. 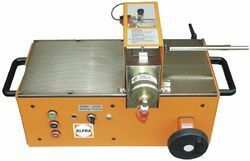 Production Speed 5.5m/min(350mm step length) Max output 2400m/shift. 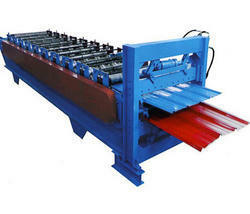 We offer a wide range of Tile Sheet Roll Forming Machine. 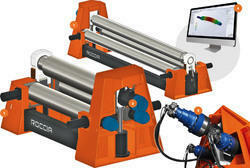 Our equipment meets the modern industry demand and uses the minimum space. The roll former is driven by a motor while the step presser & post cutter is operated by the hydraulic unit. Mitsubishi PLC unit controls the forming system, presser and cutter operation, rapidly save workforce cost. All the electrical and hydraulic parts used in our machine are universal, easily obtainable worldwide. Machine Component: hydraulic de-coiler, feeding&; pre-cutter, roll forming system, presser, post cutter, support table, PLC unit and hydraulic system. Our company has mastered the art for providing Corrugation Roll Forming Machine to the clients. Offered range is widely used in construction industry for making the roof tile and wall panel outside of building. This product is available in different specifications to fulfill the diverse needs of clients. Corrugation Roll Forming Machine is used as the roof tile and wall panel outside of building, to increase the beauty and quality of the roof tile and wall panel. This product can set several different data on the computer control cabinet according to your own need. We offer a wide range of Floor Deck Roll Forming Machine. Machine Component: automatic hydraulic decompiler, feeding device, pre-cutter, embossing device, roll forming system, post cutter, support table, PLC unit and hydraulic system. This machine is also known as Steel Deck Forming Machine. Hydraulic Decoiler active expansion, equipped with photoelectric speed monitor, its coil feeding controlled by PLC unit automatically. It cooperates with roll former synchronously and its operation is convenient. Coil car is optional. The Double Layer Roll Forming Machine is available for quickly change to produce different profiles after replaces the roller units, 2 professional workers can finish the profile change within 15 minutes with the help of crane. It saves machine cost and space rapidly. 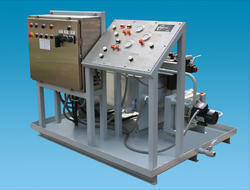 Top brand hydraulic system is adopted to enhance the stability and avoid leakage. It's installed inside machine frame to save the space, avoid damage and reinstallation after shipment. Radiator and steel wire conduit is equipped to improve its lifetime while accumulator can improve cutter and presser movement speed. This roll former can produce C and Z Quick Interchangeable Machine profile together through roller adjustment, save the space rapidly. Manual and automatic adjustment is available. Manual type just about 30 minutes to exchange one side of roller to transform C/Z shape. Automatic type can be controlled by PLC unit to exchange the horizontal distance of roller to transform C/Z shape with higher precision in 5 minutes, save the time and improve production capacity. We are the leading manufacturers and suppliers of the Rolling Curving Machine. We are the leading manufacturers and suppliers of the Punching Curving Machine.